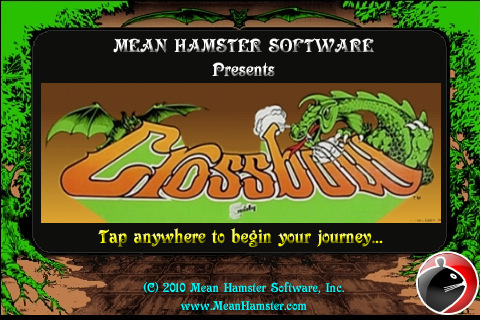 Mean Hamster is proud to announce that Crossbow, the classic shooter arcade game originally released in 1983, has just been released on Intel’s brand-spanking-new app service “AppUp“; a portal for getting your favorite mobile applications onto your PC or Netbook. Mean Hamster acquired the rights to the Exidy catalog of games a while back, with Crossbow first getting iPhone treatment in September of last year follow by an Android release a few months ago. Gameplay requires the player to protect a band of adventurers from afar by shooting objects that threaten them. The adventurers enter from the left-hand side of the screen and attempt to cross the screen unharmed. If the player helps them reach the opposite side of the screen safely, the adventurers survive to the next scenario, and new adventurers are occasionally granted between scenarios. Levels are chosen by shooting a destination on a map screen. Scenarios include: town, desert, volcano, cave, bridge, jungle, and castle. The goal is to reach the final scenario, past the castle, in which the player confronts the Master—who presumably created the dangers in the game. Defeating his manifestation (a huge face which shot projectiles from the eyes) wins the game. The player is treated to a brief congratulation and a challenge to defeat the Master again. Following this screen the player starts over with however many adventurers survived the confrontation.